The domain within your query sequence starts at position 806 and ends at position 825; the E-value for the UIM domain shown below is 1.04e-1. 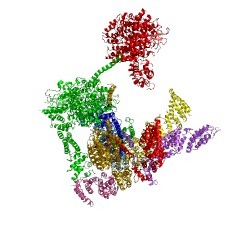 Present in proteasome subunit S5a and other ubiquitin-associated proteins. 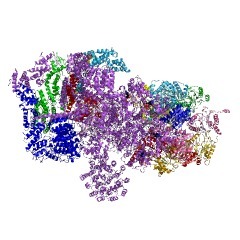 The Ubiquitin Interacting Motif (UIM), or 'LALAL-motif', is a stretch of about 20 amino acid residues, which was first described in the 26S proteasome subunit PSD4/RPN-10 that is known to recognise ubiquitin [(PUBMED:9488668),(PUBMED:11406394)]. 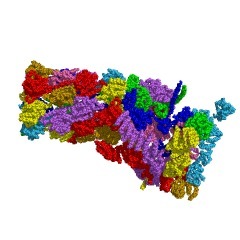 In addition, the UIM is found, often in tandem or triplet arrays, in a variety of proteins either involved in ubiquitination and ubiquitin metabolism, or known to interact with ubiquitin-like modifiers. 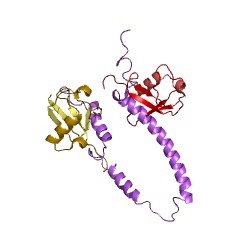 Among the UIM proteins are two different subgroups of the UBP (ubiquitin carboxy-terminal hydrolase) family of deubiquitinating enzymes, one F-box protein, one family of HECT-containing ubiquitin-ligases (E3s) from plants, and several proteins containing ubiquitin-associated UBA and/or UBX domains [(PUBMED:12062168)]. In most of these proteins, the UIM occurs in multiple copies and in association with other domains such as UBA (IPR015940), UBX (IPR001012), ENTH, EH (IPR000261), VHS (IPR002014), SH3 (IPR001452), HECT (IPR000569), VWFA (IPR002035), EF-hand calcium-binding, WD-40 (IPR001680), F-box (IPR001810), LIM (IPR001781), protein kinase (IPR000719), ankyrin (IPR002110), PX (IPR001683), phosphatidylinositol 3- and 4-kinase (IPR000403), C2 (IPR000008), OTU (IPR003323), dnaJ (IPR001623), RING-finger (IPR001841) or FYVE-finger (IPR017455). UIMs have been shown to bind ubiquitin and to serve as a specific targeting signal important for monoubiquitination. Thus, UIMs may have several functions in ubiquitin metabolism each of which may require different numbers of UIMs [(PUBMED:12121618), (PUBMED:11919614), (PUBMED:1919637)]. 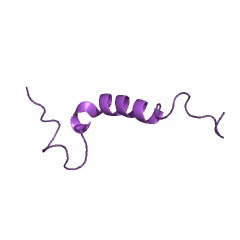 Eukaryotic PSD4/RPN-10/S5, a multi-ubiquitin binding subunit of the 26S proteasome. 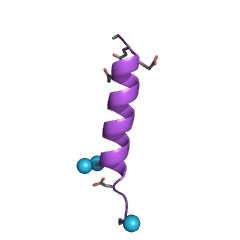 Vertebrate Machado-Joseph disease protein 1 (Ataxin-3), which acts as a histone-binding protein that regulates transcription; defects in Ataxin-3 cause the neurodegenerative disorder Machado-Joseph disease (MJD). Vertebrate hepatocyte growth factor-regulated tyrosine kinase substrate (HRS). 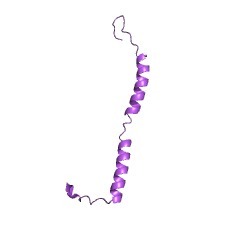 Mammalian epidermal growth factor receptor substrate 15 (EPS15), which is involved in cell growth regulation. 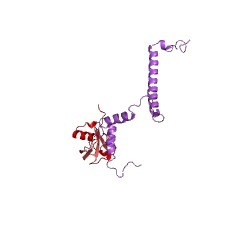 Mammalian epidermal growth factor receptor substrate EPS15R. Drosophila melanogaster (Fruit fly) liquid facets (lqf), an epsin. Yeast VPS27 vacuolar sorting protein, which is required for membrane traffic to the vacuole. 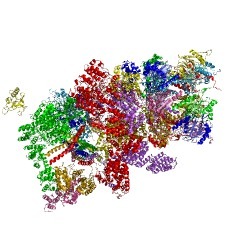 There are 36345 UIM domains in 18985 proteins in SMART's nrdb database. Taxonomic distribution of proteins containing UIM domain. This tree includes only several representative species. The complete taxonomic breakdown of all proteins with UIM domain is also avaliable. Click on the protein counts, or double click on taxonomic names to display all proteins containing UIM domain in the selected taxonomic class. 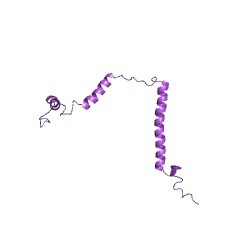 A Ubiquitin-interacting Motif (UIM) Is Essential for Eps15 and Eps15R Ubiquitination. An important negative control mechanism in the signaling of epidermal growth factor (EGF) is the endocytosis and subsequent degradation of activated EGF receptors. Eps15 and its related partner Eps15R play a key role in clathrin-mediated endocytosis of transmembrane receptors. 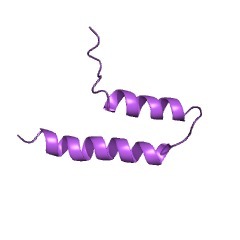 Upon EGF stimulation of the cell, Eps15 becomes both phosphorylated on tyrosine residues and monoubiquitinated. 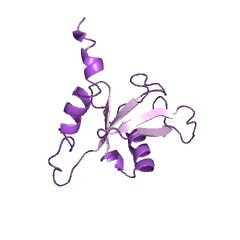 Although tyrosine phosphorylation of Eps15 has been implicated in EGF receptor internalization, the function of Eps15 ubiquitination is not known. 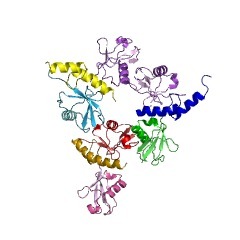 Using a mutational approach, we have found that the second ubiquitin-interacting motif (UIM) of Eps15 and Eps15R is essential for their ubiquitination. This UIM partially overlaps with the recently characterized nuclear export signal in Eps15. We show that these two overlapping motifs have different structural requirements with respect to nuclear export signal versus ubiquitination signal activity. 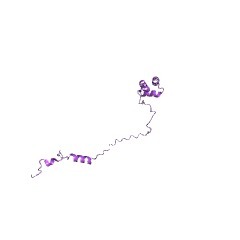 Our data demonstrate that the UIM does not contain the ubiquitin acceptor site but functions as a recruitment site for the ubiquitination machinery leading to the monoubiquitination of both Eps15 and Eps15R. The ubiquitin-interacting motifs target the endocytic adaptor protein epsin for ubiquitination. The covalent attachment of ubiquitin to proteins is an evolutionarily conserved signal for rapid protein degradation. However, additional cellular functions for ubiquitination are now emerging, including regulation of protein trafficking and endocytosis. 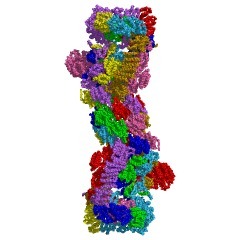 For example, recent genetic studies suggested a role for ubiquitination in regulating epsin, a modular endocytic adaptor protein that functions in the assembly of clathrin-coated vesicles; however, biochemical evidence for this notion has been lacking. 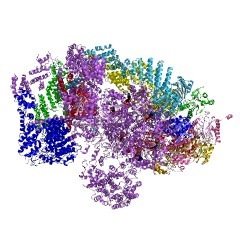 Epsin consists of an epsin NH(2)-terminal homology (ENTH) domain that promotes the interaction with phospholipids, several AP2 binding sites, two clathrin binding sequences, and several Eps15 homology (EH) domain binding motifs. 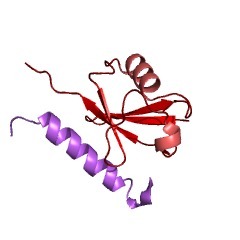 Interestingly, epsin also possesses several recently described ubiquitin-interacting motifs (UIMs) that have been postulated to bind ubiquitin. 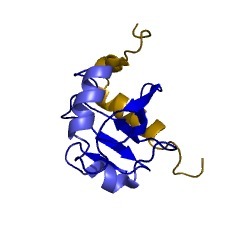 Here, we demonstrate that epsin is predominantly monoubiquitinated and resistant to proteasomal degradation. 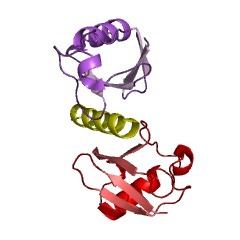 The UIMs are necessary for epsin ubiquitination but are not the site of ubiquitination. Finally, we demonstrate that the isolated UIMs from both epsin and an unrelated monoubiquitinated protein, Eps15, are sufficient to promote ubiquitination of a chimeric glutathione-S-transferase (GST)-UIM fusion protein. Thus, our data suggest that UIMs may serve as a general signal for ubiquitination. A single motif responsible for ubiquitin recognition and monoubiquitination in endocytic proteins. 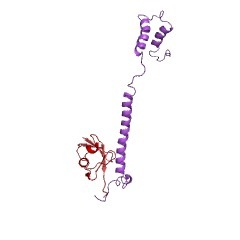 Ubiquitination is a post-translation modification in which ubiquitin chains or single ubiquitin molecules are appended to target proteins, giving rise to poly- or monoubiquitination, respectively. 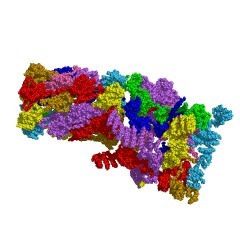 Polyubiquitination targets proteins for destruction by the proteasome. The role of monoubiquitination is less understood, although a function in membrane trafficking is emerging, at least in yeast. Here we report that a short amino-acid stretch at the carboxy-termini of the monoubiquitinated endocytic proteins Eps15 and eps15R is indispensable for their monoubiquitination. A similar sequence, also required for this modification, is found in other cytosolic endocytic proteins, such as epsins and Hrs. 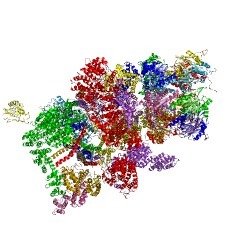 These sequences comprise a protein motif, UIM (ref. 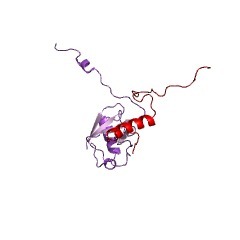 6), which has been proposed to bind to ubiquitin. We confirm this for the UIMs of eps15, eps15R, epsins and Hrs. 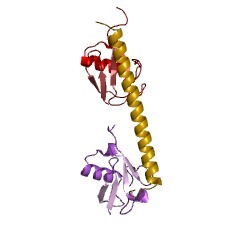 Thus, the same motif in several endocytic proteins is responsible for ubiquitin recognition and monoubiquitination. Our results predict the existence of a UIM:ubiquitin-based intracellular network. Eps15/eps15R, epsins and Hrs may function as adaptors between ubiquitinated membrane cargo and either the clathrin coat or other endocytic scaffolds. In addition, through their own ubiquitination, they may further contribute to the amplification of this network in the endocytic pathway. 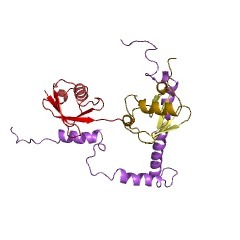 Interaction of hHR23 with S5a. 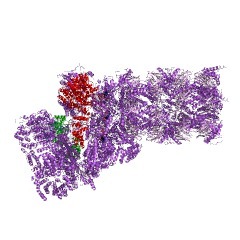 The ubiquitin-like domain of hHR23 mediates interaction with S5a subunit of 26 S proteasome. hHR23B is one of two human homologs of the Saccharomyces cerevisiae nucleotide excision repair (NER) gene product RAD23 and a component of a protein complex that specifically complements the NER defect of xeroderma pigmentosum group C (XP-C) cell extracts in vitro. 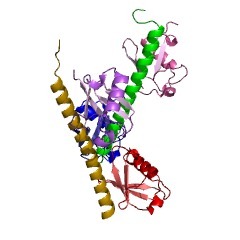 Although a small proportion of hHR23B is tightly complexed with the XP-C responsible gene product, XPC protein, a vast majority exists as an XPC-free form, indicating that hHR23B has additional functions other than NER in vivo. Here we demonstrate that the human NER factor hHR23B as well as another human homolog of RAD23, hHR23A, interact specifically with S5a, a subunit of the human 26 S proteasome using the yeast two-hybrid system. Furthermore, hHR23 proteins were detected with S5a at the position where 26 S proteasome sediments in glycerol gradient centrifugation of HeLa S100 extracts. Intriguingly, hHR23B showed the inhibitory effect on the degradation of (125)I-lysozyme in the rabbit reticulocyte lysate. 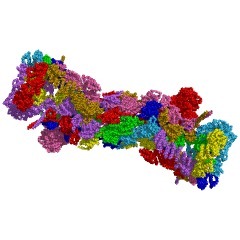 hHR23 proteins thus appear to associate with 26 S proteasome in vivo. From co-precipitation experiments using several series of deletion mutants, we defined the domains in hHR23B and S5a that mediate this interaction. From these results, we propose that part of hHR23 proteins are involved in the proteolytic pathway in cells. Epsin is an EH-domain-binding protein implicated in clathrin-mediated endocytosis. During endocytosis, clathrin and the clathrin adaptor protein AP-2, assisted by a variety of accessory factors, help to generate an invaginated bud at the cell membrane. 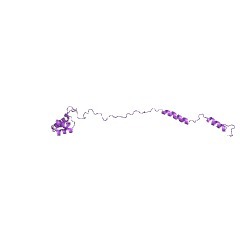 One of these factors is Eps15, a clathrin-coat-associated protein that binds the alpha-adaptin subunit of AP-2. Here we investigate the function of Eps15 by characterizing an important binding partner for its region containing EH domains; this protein, epsin, is closely related to the Xenopus mitotic phosphoprotein MP90 and has a ubiquitous tissue distribution. It is concentrated together with Eps15 in presynaptic nerve terminals, which are sites specialized for the clathrin-mediated endocytosis of synaptic vesicles. 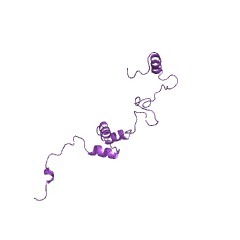 The central region of epsin binds AP-2 and its carboxy-terminal region binds Eps15. Epsin is associated with clathrin coats in situ, can be co-precipitated with AP-2 and Eps15 from brain extracts, but does not co-purify with clathrin coat components in a clathrin-coated vesicle fraction. When epsin function is disrupted, clathrin-mediated endocytosis is blocked. 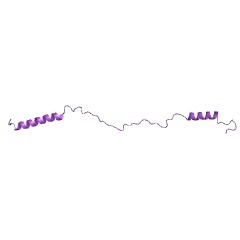 We propose that epsin may participate, together with Eps15, in the molecular rearrangement of the clathrin coats that are required for coated-pit invagination and vesicle fission. 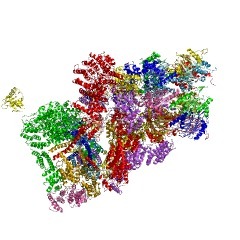 VHS domain marks a group of proteins involved in endocytosis and vesicular trafficking. Endocytosis is driven by a mechanism which is characterized by an orderly congregation of a large number of proteins which effectuate, first, formation of a coated vesicles, second, pinching off the vesicle and, third, regulated transport. True to the nature of many other proteins involved in multimolecular complexes, also endocytosis-associated proteins, such as Eps15, clathrin and AP-2, are characterized by distinct domains which mediate the protein-protein interactions. 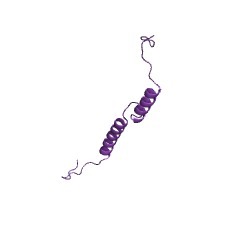 We now report that a group of well-established endocytosis and/or vesicular trafficking proteins possess a VHS domain, a recently described domain with an unknown function. 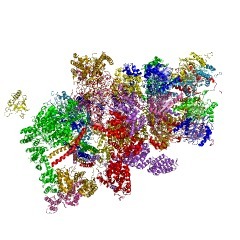 We suggest that in these proteins VHS serves as a membrane targeting domain which by its specific features together with FYVE, SH3 and/or TAM domains, which are also present in some VHS-containing proteins, is involved in the stage-specific assembly of the endocytic machinery. This information is based on mapping of SMART genomic protein database to KEGG orthologous groups. Percentage points are related to the number of proteins with UIM domain which could be assigned to a KEGG orthologous group, and not all proteins containing UIM domain. Please note that proteins can be included in multiple pathways, ie. the numbers above will not always add up to 100%.